As such it is often considered predictive of an ‘auspicious year, in general signifying a year of wealth & good fortune! 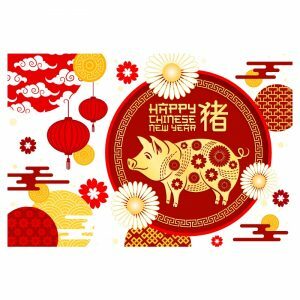 February 4, 2019 is typically time for a big family reunion dinner as it represents the 30th day or Lunar New Year’s Eve. After the feast, families will stay up past midnight to welcome in the new year. Discard trash before midnight of the Eve of the Lunar New Year so as to not wipe or sweep away any of the Good Luck that is coming into your home along with the Lunar New Year. The character for book Shu1 is the same as the word for ‘lose’; gifting of books during this time is also considered wishing bad luck on the recipient.